A big mouth pig who becomes Napoleon’s mouthpiece. Throughout the novel, he displays his ability to manipulate the animals’ thoughts through the use of hollow, yet convincing rhetoric. Represents the propaganda department that worked to support Stalin’s image; the members of the department would use lies to convince the people to follow Stalin. A dedicated but dimwitted horse who aids in the building of the windmill but is sold to a glue-boiler after collapsing from exhaustion. Represents the dedicated, but tricked communist supporters of Stalin. Many stayed loyal even after it was obvious Stalin was a tyrant. Eventually they were betrayed, ignored, and even killed by him. 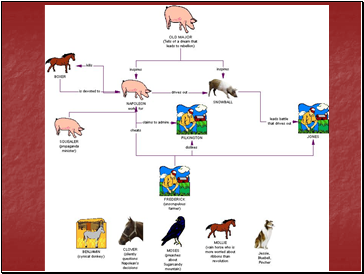 The farm's sheepdog, she keeps tabs on the pigs and is among the first to suspect that something is wrong at Animal Farm. A tame raven and sometimes-pet of Jones who tells the animals stories about a paradise called Sugarcandy Mountain. 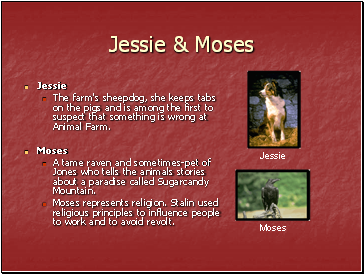 Moses represents religion. Stalin used religious principles to influence people to work and to avoid revolt. 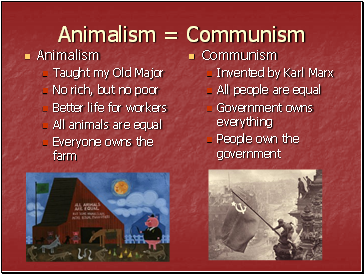 Pilkington Jones' neighbor, he finds a way to profit from Animal Farm by forming an alliance with the pigs. 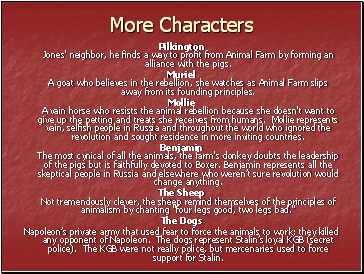 Muriel A goat who believes in the rebellion, she watches as Animal Farm slips away from its founding principles. Mollie A vain horse who resists the animal rebellion because she doesn't want to give up the petting and treats she receives from humans. Mollie represents vain, selfish people in Russia and throughout the world who ignored the revolution and sought residence in more inviting countries. Benjamin The most cynical of all the animals, the farm's donkey doubts the leadership of the pigs but is faithfully devoted to Boxer. Benjamin represents all the skeptical people in Russia and elsewhere who weren’t sure revolution would change anything. The Sheep Not tremendously clever, the sheep remind themselves of the principles of animalism by chanting "four legs good, two legs bad." Napoleon’s private army that used fear to force the animals to work; they killed any opponent of Napoleon. The dogs represent Stalin’s loyal KGB (secret police). The KGB were not really police, but mercenaries used to force support for Stalin.